Russia's robotic Progress 60 cargo vessel approaches the International Space Station on July 5, 2015. A robotic Russian resupply ship arrived at the International Space Station early Sunday morning (July 5), ending a streak of two straight cargo-mission failures. 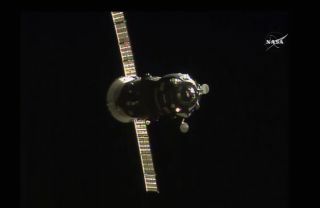 Russia's Progress 60 freighter docked at 3:11 a.m. EDT (0711 GMT) Sunday, while the space station was 251 miles (404 kilometers) above the Pacific Ocean to the southeast of New Zealand. Astronauts aboard the orbiting lab will soon begin offloading the 6,100 lbs. (2,770 kilograms) of food, water, fuel and other supplies brought up by the vessel. The mission of Progress 60, which launched early Friday morning (July 3), was more closely watched than most cargo runs to the space station, because the previous two such efforts were unsuccessful. And the Progress 59 vessel fell back to Earth in May, about nine days after experiencing a problem during launch. Investigators later traced the cause to an issue with the third stage of the Russian Soyuz rocket that lofted the freighter. The space station is fairly well stocked despite these back-to-back mishaps: It had enough supplies to support crewmembers through October before Progress 60's arrival, NASA officials said in the wake of the Falcon 9 explosion. Three people currently live and work aboard the orbiting lab: NASA astronaut Scott Kelly and cosmonauts Mikhail Kornienko and Gennady Padalka. Kelly and Kornienko are about three months into the first-ever yearlong mission aboard the station, which is designed to help pave the way for the lengthy journey to Mars. Three more spaceflyers are scheduled to join this skeleton crew on July 22, bringing the station back up to full strength. Another cargo vessel is slated to arrive relatively soon as well: If all goes according to plan, Japan's robotic H-2 Transfer Vehicle freighter will blast off on Aug. 16.